Tune in now to see the 2019 McLaren car unveiled as the Woking team become the latest to reveal their contender for the new Formula 1 season. 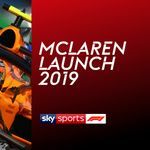 Sky F1's Simon Lazenby hosts the event live from the McLaren Technology Centre - which began at 12 noon in the stream above. It's an all-new driver line-up for McLaren in 2019 with Carlos Sainz joining to partner British rookie Lando Norris, a graduate of the team's junior programme who has starred in the junior categories. McLaren begin their second year with Renault engines and are aiming to make progress up the filed after a sixth-place finish in 2018.